Senior Advocate Shyam Divan concludes his rejoinder for the Petitioners followed by Gopal Subramaniam. Shyam Divan continues his rejoinder. Talks about how inorganic seeding is happening under Aadhaar. Points out that the security at the AUA and KUA level is compromised, no matter how secure the CIDR is. Now talks about the pre-Aadhaar Act regime. He says that UIDAI collected the biometrics of a 100 crore without statutory or other written authority. Says that this goes to the core of the rule of law. We are not living under a monarch, where you can do these things with a gesture. Says that there was no valid contractual relationship between the UIDAI and the agents. Says that the UIDAI has admitted that it does no verification at the stage of enrolment and takes no responsibility for the same. 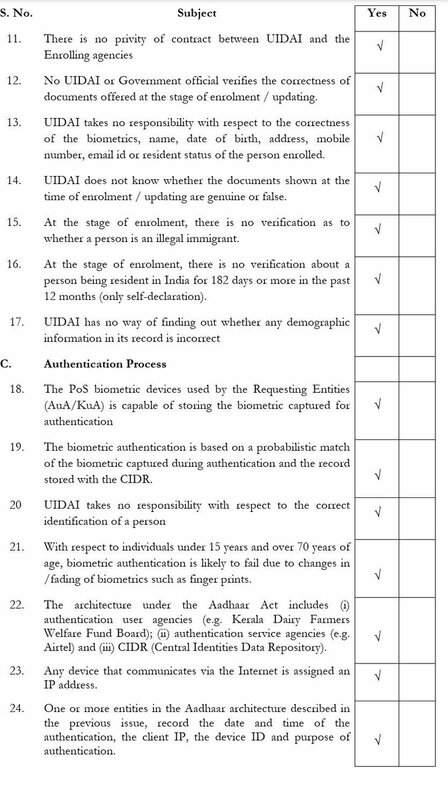 Says that UIDAI has admitted that the AUAs can store biometrics. And this was found by auditors, who has to force them to remove it. UIDAI only matches. It takes no responsibility for actual identification. Think of it this way. From the citizen’s perspective there are two towers. An enrollment Tower and an authentication Tower. In this ecology system created by the statute, location, date/time and purpose are all known. This is 100% surveillance. The discretion to actually use exception mechanisms if authentication fails us with the distributor. So you’re putting the citizen at the mercy of that person on the ground. Over time as Aadhaar authenticating becomes ubiquitous, tracking and profiling will become more comprehensive. Contrary to what Rakesh Dwivedi argued, authentication is not just one time. Has prepared an illustrative chart showing an individual’s authentication log over three days. He hands it over to the Court. Has divided the log into activities that are undertaken once in a lifetime, one a year, monthly, and frequently. In response to a question from Justice Bhushan, clarifies that this log is hypothetical and the purpose is to show how much data is collected. Says that the CEO UIDAI has provided his own log, but he would prefer not to go into that, since it may cause embarrassment. Comes to the ID4A, the World Bank report that was cited by the Attorney General. 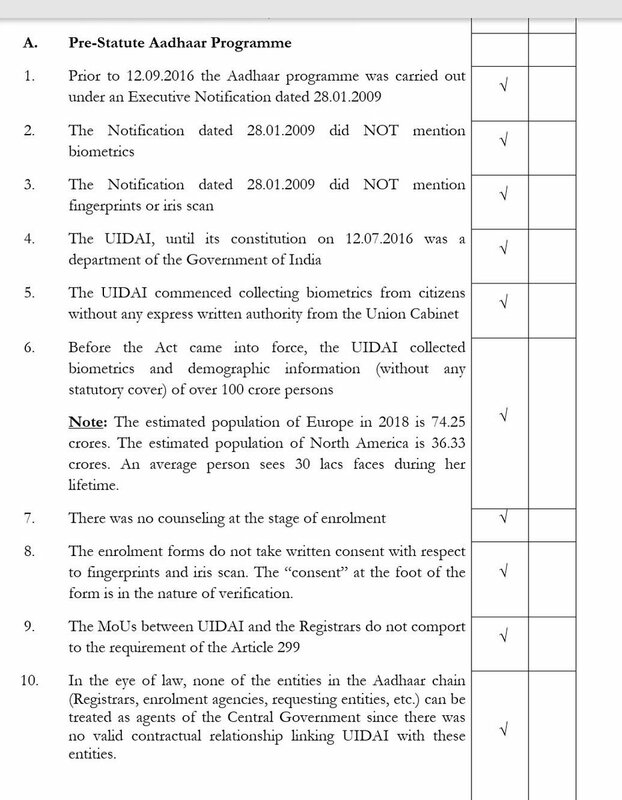 Refers to the list of AUAs and KUAs, which are presently using Aadhaar authentication, and all of this will come into the log. Says that the World Bank’s report has been relied on extensively by the Attorney General (Identification for Development). Says that if you look at page 3, para 2 which says that the WB has partnered with Accenture. I wonder whether that name rings a bell. Hands over a document to the Court. It is a press release from Accenture from 2010 which says that Accenture has been selected to facilitate the UIDAI’s work. Says that this is not a bad thing. But it is nothing more than a sales pitch. 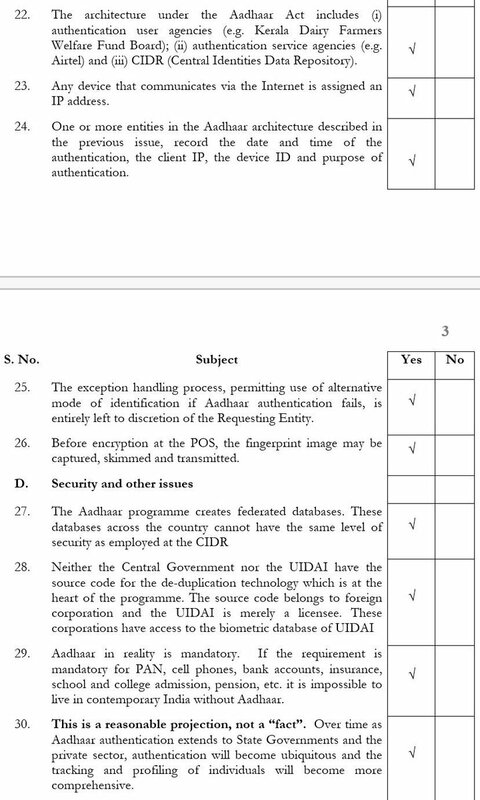 Says that on this Report the High Level Committee includes Nilekani, who was the chairperson of UIDAI. Repeats that there is nothing wrong with this, but that the Court should keep this in mind when deciding how much weight to give this report. Now comes to S 59 of the Aadhaar Act, which attempts to validate all actions before the Aadhaar Act was passed. Says that even if this is a successful validating clause, it can’t validate actions not done by the central government, and can’t validate actions that were even ultra vires the notification. The notification made no mention of biometrics. So biometric collection before Act can’t be validated. Discusses the judgment of West Ramnad. Says that even if the notification was a parliamentary statute, unless it specifically mentioned biometrics, collection would be illegal. You can’t have collection of something as invasive as biometrics without express authority. Justice Chandrachud asks what would be the consequences if Mr Divan is right. Shyam Divan says that if this submission is accepted, all enrolments prior to the Act will have to go. Comes to Section 7. He says there are 144 notifications that cover 252 schemes. First, schemes that apply to children should be excluded. Secondly, exclude schemes that are based on competitions etc. Thirdly, exclude schemes that have to do with rehabilitation. Fourthly, matters of food and health should be excluded. Justice Chandrachud says that what principle should be evolved. Shyam Divan talks about the affidavit filed by Reetika Khera on the issue of exclusion. Justice Chandrachud asks if S7 can be interpreted in a way that prevents exclusion. Asks whether there is any principled interpetation of words like subsidies, benefits and services that would prevent its mindless expansion. Shyam Divan takes the example of a lawyer who was in a coma, and the bank threatened to cut off her pension. Justice Chandrachud says that there is no question that this is an issue and that it has to be addressed. Shyam Divan says that human rights law has a principle of non-retrogression. Bench rises for lunch. To continue at 2 30. Session 2. Shyam Divan continues his rejoinder. He takes the Court through some of the schemes under Section 7. These include the Sarva Shiksha Abhiyaan and Mid-Day Meal schemes. Says that there is no question of subjecting children to this. Says that the second class of schemes is involving merit, such as painting and essay competitions for schoolchildren, for which Aadhaar has been made mandatory. Says that this goes way beyond any conception of proportionality. Says that the third category is schemes for rehabilitation that involve stigma, such as bonded labour and trafficking victims. Asks how Aadhaar can be made mandatory for this most vulnerable class of people. Justice Sikri says that under the garb of distributing these schemes, it should not be the case that undeserving or fraudulent people get benefits. Says that he understands there are issues of exclusion, but there’s also an issue of fraud, and how do you address that issue. Shyam Divan says that there must be a reasonable alternative way of identification that is allowed to an individual. Says that for health-based schemes, I may not want to reveal that I have tuberculosis. Says that there is a scheme called the Jiyo Parsi Scheme to increase the number of Parsis, and even for that they have made Aadhaar mandatory. Says he will sum up. He says that if you look at Aadhaar as a whole, it is increasing the coercive power of the State against the individual. Says that personal autonomy extends to controlling where I have to put my fingertips. Minimal requirements for specialised purposes such as passport, but this is overarching. Repeats that I can change my password, but not my fingerprints. Concludes his arguments on Section 7. He comes to the violation of the interim orders of the Court, which he says have been repeatedly violated by the government. Says that the magic of Articles 226 and 227 lies in the fact that bureaucrats and legislators know that there is an independent court that will review their actions for constitutionality. Quotes Seervai. Comes to the issue of money bill. He says that the Aadhaar Act has a huge impact on human rights. The Constitution has a very intricate scheme of defences for protecting rights. The last line of defense is the Court. But there are other concentric defences and bulwarks. Says that there are two crucial bulwarks. The first is the Rajya Sabha. In the Aadhaar Act that protection has been lost. Says that the second important bulwark is Article 111 of the Constitution (assent to bills). Says that this protection (Presidential review and return of bills for reconsideration) has also been done away with by labeling Aadhaar a money bill. Says that this Court has always been the champion of human rights. Justice Chandrachud refers to his judgment on Ordinances, which used similar logic to read the Ordinances provision narrowly. Shyam Divan comes to the issue of demographic information. He says that the other side has belittled the importance of demographic information. But in many situations, privacy of demographic information is crucial. For example, journalists doing investigative work, women who can be stalked if their demographic information is available. Ends by summarising the features of Aadhaar that are fatal. (3) No authority to collect biomemtrics before the Act. These words suggest choice and they suggest democracy. Gopal Subramaniam will continue the rejoinder. The basic question is this: what so you do about acts of misfeasance and malfeasance in the delivery of public services? It is important to note that these are government functionaries. And the government cannot place the burden of its own failures on the people. Has the State produces evidence that children want a fake midday meal or that a widow wants a second pension? It’s not the beneficiaries who are cheating the system, but by functionaries of the State. Justice Sikri says that it’s also intermediaries such as fair priced shop owners. Gopal Subramaniam says he completely agrees. And in each situation, the victims are the beneficiaries. Says that this contemplates authentication records, which gives the footprint of your activities to the State. Is there a nexus between this knowledge being with the State and the delivery of public services? The answer is in the negative. This violates the requirements of the privacy judgment that the infringement be minimal. Justice Sikri says that the other side has argued that because of deduplication, fakes have been weeded out. Gopal Subramaniam says that this is a “voluptuous” claim. He reads out the figures. Says that in this case, a number has become a form of identity. Asks what school admissions have to do with delivery of public services. He says that this is no more empowering or enabling, but actually disempowering. Says that if law has the effect of disempowering people, and impairing the identity guaranteed to them by the Constitution, it must fall. When a law imposes a condition of this kind, the State becomes a granter. It reverses the relationship between the individual and the State. The question is if this law is one that places fetters upon people, even though the motives are benign? Discusses the case of West Ramnad, which was relied on by the State. Says that West Ramnad was a case about the powers of the State to retrospectively enact law. Discusses the Mysore Improvement case, which was also about retrospective lawmaking. Says that retrospective validation is possible only if you had a law in the first place, and you had valid actions under that law. Here there was never any law, and there is a fundamental rights violation. Bench rises. Petitioners will finish arguing by 4 30 tomorrow.